Map of the New England or Eastern States. 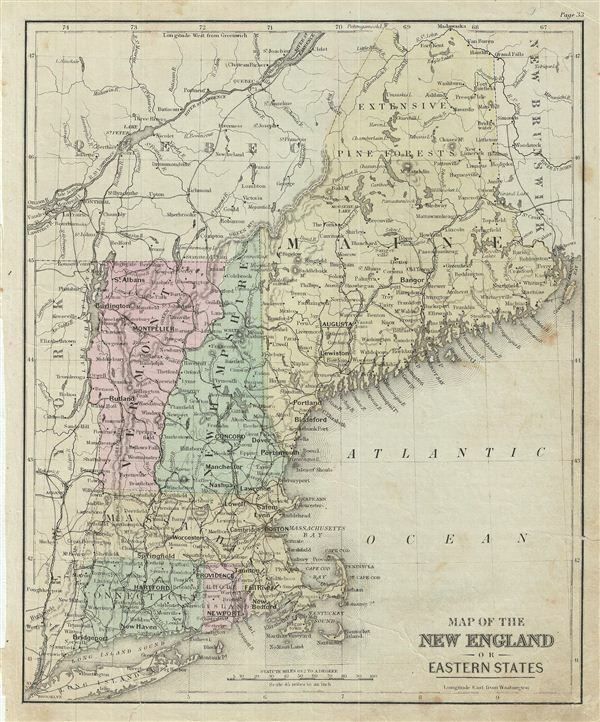 This is an example of David M. Warren's 1879 map of New england or the eastern States. It covers Maine, New Hampshire, Vermont, Massachusetts, Connecticut and Rhode Island. Parts of neighboring New York, Long Island, Quebec and New Brunswick. Identifies Killington Peak and Camel's Hump in Vermont, now popular ski resorts. The northern part of Maine is marked with 'extensive Pine Forests.' Throughout, the map identifies various railroads, cities, towns, rivers, islands, mountain passes and an assortment of additional topographical details. The map is color coded according to regional and political boundaries with elevation rendered by hachure. Issued as page 33 in the 1879 edition of Warren's Common-School Geography.